Till 18 Jun 2018 Hello Bicycle: Clearance Sale with Up to 50% OFF Bicycles and Accessories! 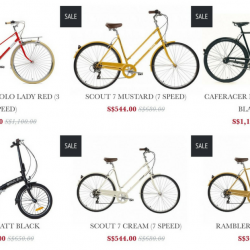 Hello, Bicycle Singapore is the largest importer of lifestyle bicycles and cycling accessories for leisure, commuting and fitness. Bikes for the whole family - Ladies, Gentleman and kids. Well known brands from USA and Europe. LINUS, CREME, LEKKER, SHULZ, ABUS, HAMAX, KlickFix, MELON, ORONTAS, Apres Velo, VP-components, Busch and Muller, Spanning and many others. Now get a bike of your own during their clearance sale and save up to 50%! Sale ends 18 June.